Further evidence of a LC I large building complex and a series of floors dating to the EC III age. 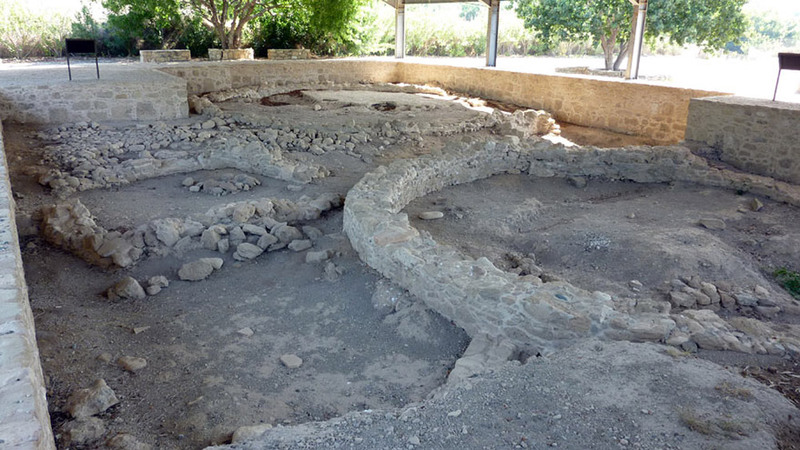 The Department of Antiquities, Ministry of Communications and Works, announces the completion of the 2013 season of excavation at the Bronze Age settlement of Kissonerga-Skalia near Paphos. The excavation was carried out during July by a University of Manchester team under the direction of Dr Lindy Crewe. The team uncovered further evidence of a large building complex dating to the threshold of the Late Cypriot Bronze Age (around 1750–1600 BC), which had been partially revealed in previous seasons and also investigated a series of floors in an earlier domestic area dating to the Early Bronze Age (around 2300–1900 BC). During the final phase of occupation a large complex covering an area of 750m2 was built, using a variety of techniques with thick stone wall foundations up to 1.2 metres wide. A large wall of uncertain function now extends to over 45 metres long and is not yet fully excavated. After the previous season the wall enclosed an area of around 20 x 10 metres, but this season it has turned back on itself to form an ‘S-shape’. The team has revealed a large courtyard with a plaster floor on which were found plastered pits, pottery, weights and spindle whorls and evidence for large-scale industrial activities. The space to the southwest of the courtyard wall has now been partially excavated and further walls were revealed, subdividing the area. As with all the architecture in the final phase at Kissonerga-Skalia, the walls do not form right angles, creating a parallelogram rather than a rectangular space. Within this space, a heavily disturbed line of small stones with mud plaster chunks seems to represent the remains of an interior bench running along the wall. Upon the floor an unusually high concentration of fine ware pottery bowls and small juglets were found in the typical local styles of Drab Polished ware and Red Polished ware and it may be a domestic space. It is not clear what kinds of industrial activities were undertaken in other areas of the site but two large storage jars partially embedded in the ground were found adjacent to deep, narrow pits filled with charcoal, along with a small stone-built structure that was filled with fine ashy soil.